Many stories about english travellers, businessmen and hope and new lands seekers passed by “La Salada”. Its name comes from a lake bordering the countryside which was called “La Salada”. Until 1804, La Salada was part of a land named “Segismundo´s fields” (Campos de Segismundo) or “Portuguese’s ranch” (Estancia de los Portugueses). During 1825, It was the Gibson brothers (from Gibson and Sons firm, England), who took possession of a biggest district that contained “La Salada”, named “The ranch of the English man” (“Campo del Inglés”), and subdivided that ranch in three parts. 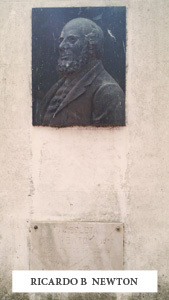 One of them was bought by Francisco Piñeyro; the second one, on the south, by Alejo Llanos, and the part which was on the river was sold to Ricardo B. Newton (it is important to highlight that it was him who introduced the wire fence in Argentina). In 1834, Ambrosio Cramer divides the second part of the smallholding in two: one of those is acquired by Mariano Alvarez, who, in turn, subdivided it in several parts. One of them will be the one to be transformed in “La Salada”. The ancient historical center is surrounded by aged banana and fig trees, maybe from a European origin. It is interest to comment that the doors which face the outside of the historical center has been built originally with lintels that have less high of the ones which face the inside part. During the siege, this used to hamper the Indians entering by a riding attack. In addition, windows have iron grilles that show a great antiquity in their type (in that time, it wasn´t very common to see them). The thick walls to the outside in doorways and windows have been built with a lower altitude that allowed the inhabitants to post with the weapons, so that they could discharge in a covered position to defend themselves. Paying attention to these characteristics, it is very probable that the historic center of La Salada had worked as an outpost in its origins. Despite of its age, it is extremely interesting that this building still retains the original wooden floor, being one of the few cases in which this kind of floor with wide planks can be seen. An anecdote tells that, somewhere in its interior, there is an access to a tunnel which, in case of life risk, allowed people to escape to the outside without being seen by the Indians or the fugitives, thus safeguarding women and children first. 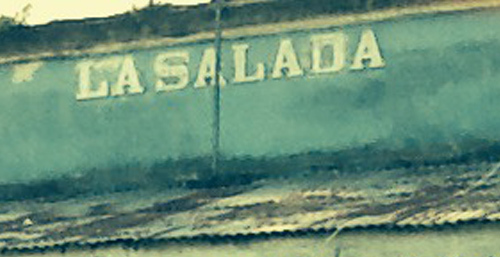 By last, in the stately front that takes to the principal entrance trough the banana trees, it can be seen the well known and antique inscription “LA SALADA”.